Our monthly lunch club group may occasionally act like giddy teenagers during our get-togethers, but a couple of our companions’ recent medical woes have become a painful reminder that we are now far removed from those earlier carefree times. Our longtime friend Mary Cole was visiting from Palm Springs and filled in admirably for Josh who is still on the mend and attempting to regain his strength after a long illness. Our small group has resembled a “MASH” unit in recent months with mounting casualties standing between us and a few first-class meals at famous restaurants in Southern California. Nevertheless, our fearless team has pushed ahead. Mary returns often to the Palisades where she was a respected fixture in our community for more than 40 years before moving to the desert in 2011. We asked her to join us for our trek to The Talpa in West L.A. When entering the back door of Talpa, you find yourself surrounded by the warm welcoming atmosphere of this authentic Mexican food palace. When I was growing up in Texas, there was an iron-clad rule that alleged if a Mexican restaurant had chandeliers and marble floors, one should quickly find the nearest exit before trying the food—which was guaranteed to be absolutely dreadful. We surveyed Talpa’s homey laid-back surroundings and knew we were in for a treat. 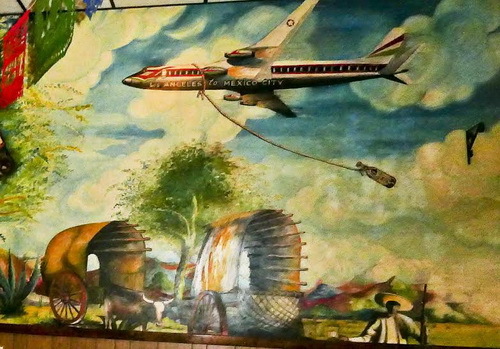 Hand-painted wall murals celebrate Talpa de Allende, the silver mining village of Jalisco, Mexico, for which the restaurant is named. 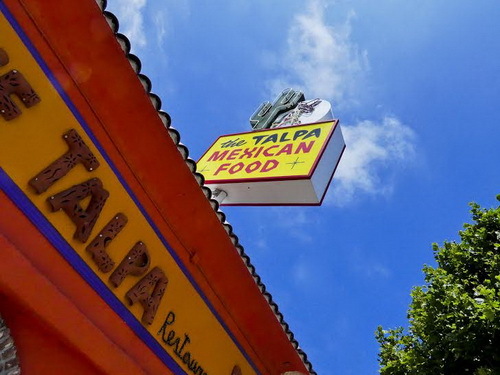 Many of Talpa’s customers have been coming back for decades since the restaurant first opened its doors in 1964. 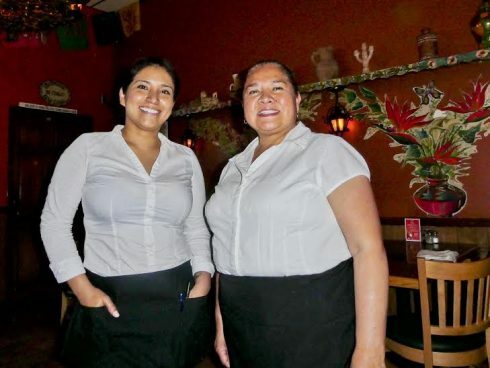 Three of its servers have long histories with the restaurant—Celina, 40 years, Pola, 28 years, and Lily (the “rookie”)—only 22 years. Actually, our server Maria was likely the real rookie, whose age appeared to be about the same as Lily’s tenure at the restaurant. I am one of those customers that has eaten there for decades, but after a long inexplicable absence, I’ve returned often in recent months only to be reminded what an enjoyable and relaxed dining experience awaits Talpa’s guests. We ordered margaritas to celebrate Mary’s return to town and caught up with her life in Palm Springs where she has already made numerous friends. She sees Roy Robbins often, who once owned a thriving gift shop on Swarthmore. None of us ever had any concerns about her meeting people when she first moved to the desert. In fact, when Mary visits the Palisades, we always feel lucky to have been included, since her calendar is filled with reunions with longtime friends. Barry ordered the potato taco and Chile relleno, while Arnie tried the “Burrito Caballero” with pico de gallo, avocado, and spicy beef tomatillo sauce. And speaking of spicy, Barry said he had noticed a huge delivery of fresh peppers at the kitchen door as we were arriving. After finishing our meal, we decided most of that shipment had been used in the preparation of our table’s lunches. The kitchen staff has never been shy about their use of chili peppers at Talpa. 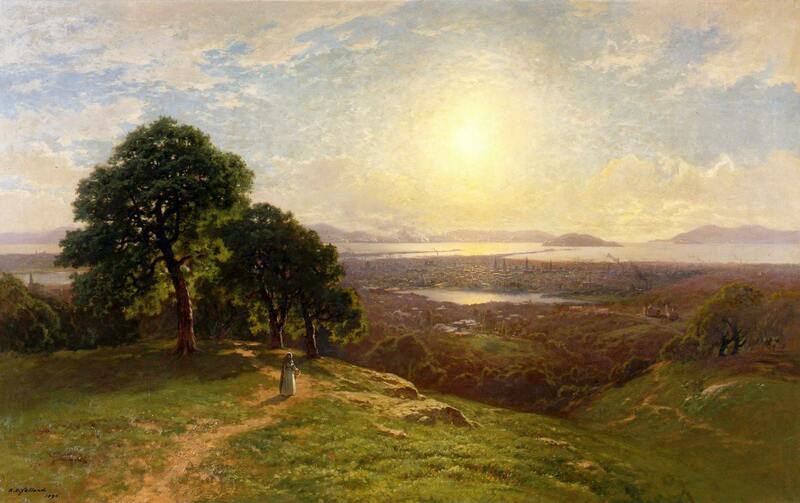 Mary, who showed great restraint in her ordering, had a simple beef taco. We decided later that her disciplined eating habits made the rest of us look like barbarians. I, Barbarian Bob, chose the Carne Asada, two thinly-sliced flank steaks (each one larger than my size-12 Nike sneakers) and garnished with guacamole—the steaks—not my sneakers. We topped off our lunch with an order of their caramel flan, which I have always claimed is the best served this side of Austin, Texas. I received little argument from my tablemates. I could have eaten three more servings, but with the ever-gracious Mary in our presence, I would have been in danger of furthering my barbarian image. We raised a glass to Josh’s hasty return for our future outings. And despite recent setbacks, we pledged to continue our mission of uncovering L.A.’s vintage dining emporiums—whether they be fashionable or funky—and never forgetting to act like giddy teenagers along the way. Bob Vickrey is a writer whose columns appear in several Southwestern newspapers including the Houston Chronicle. He is member of the Board of Contributors for the Waco Tribune-Herald and a monthly contributor for the Boryana Books website. He lives in Pacific Palisades, California.